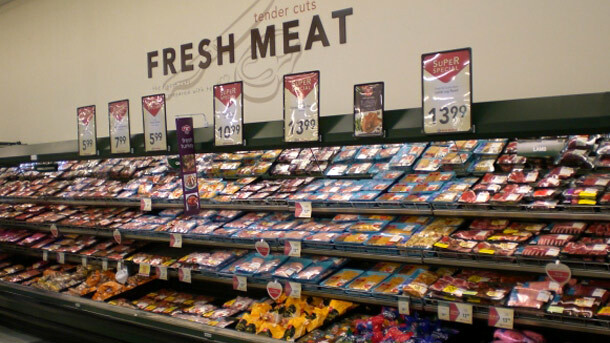 One of my biggest stumbling blocks has been how to buy meat without plastic. Sausages, chops, steak..you name it, it comes wrapped the same way in every supermarket in the country. In today’s world plastic is obligatory when you buy meat . Whole chickens only come in plastic bags. Fresh fish over the counter? At New Word they offer a one-size fits all paper/plastic/foil laminate bag which is wholly non-recyclable and for most purchases more packaging that is needed. Independent butchers somewhat better in that If you buy something over the counter you at least avoid the polystyrene tray, but they still put the item in a plastic bag. Of course they do, what other option do they have? It is quite a price to pay every time I tuck into spaghetti bolognaise, roast chicken or bbq steak. New World’s new recyclable PET meat tray will reduce the amount of waste going to landfill. New World have improved the situation recently by being the first supermarket in the world to develop a recyclable PET meat tray. 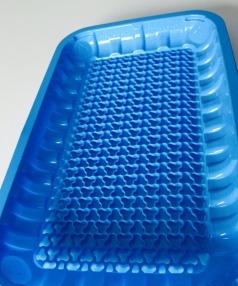 It does feel a lot better being able to recycle the tray and only put the wrap in the rubbish, and this solution must already being having a positive effect on landfill volumes. But, and there is a but, none of this thinking reduces the demand for plastic. It doesn’t challenge the need for plastic or encourage people seek alternatives. So I am trying to avoid all plastic meat packaging, recyclable or not. I did some research and finally stumbled upon an alternative: bring your own containers. Why had I never thought of this before? Bring them to the supermarket, to the butcher. Have them tare it on the scales, pop the item in. Boom. Just like that. Now all you have to do is take that container home and pop it directly into the freezer. Brilliant! Much encouraged by this idea, I took myself off to Briscoes and invested in two Anchor-Hocking glass containers with airtight lids which, wonderfully, can be put in the freezer. I have had success at New World in New Lynn where, after some discussions with this manager and that manager, I was allowed to purchase fish and have it placed directly into the container. I was so happy about this, what a win! However the meat they offer over the counter tends to be their expensive, top-of-the-range stuff rather than the mince, drumsticks and sausages that make up our standard shop. So sadly on this occasion I was obliged to accept the standard packing options for the rest of the meat shopping. Fish bought from New World, the chicken breasts from Clark’s Organic Butchery. This has made me look further afield and to venture into butchers in the area. So far I have been to The Aussie Butcher in New Lynn, Clark’s Organic Butchery in Glen Eden and even further away, Westmere Butchery in, well in Westmere. I think there is likely to be a Mad Butcher out this way that I have not yet discovered. I’m happy to report that all three accepted my glass containers. Clark’s have a wonderful range, though I’m still smarting at the higher prices you pay for organic meat. Moving to organic is something I’m considering, pending further research. I have to say I do balk a little at the prices but I can’t deny their product is of the highest quality and no doubt is better for us and the planet. I figure perhaps it would be better for our family if we ate a little less meat of better quality or had one or two vegetarian dinners each week so we better afford it, and I have to say I don’t have the family’s full support in this ‘reducing meat’ proposal so I’m not sure we’ll be making the shift just yet. Clark’s also make their own bacon and while they vacuum package most of it they offered to let me know when they make it so I can go it and buy some plastic-free. The Aussie Butcher offers most of their produce pre-packaged in the usual way, and only a small selection over the counter. So less options here. Westmere Butchery is a good middle ground, offering a fantastic selection of meats over the counter and, being non-organic, at a more moderate price, the only shame is that they are the furthest away! Notwithstanding that, it is a wonderful shop which is always packed with customers irrespective of the day of the week. 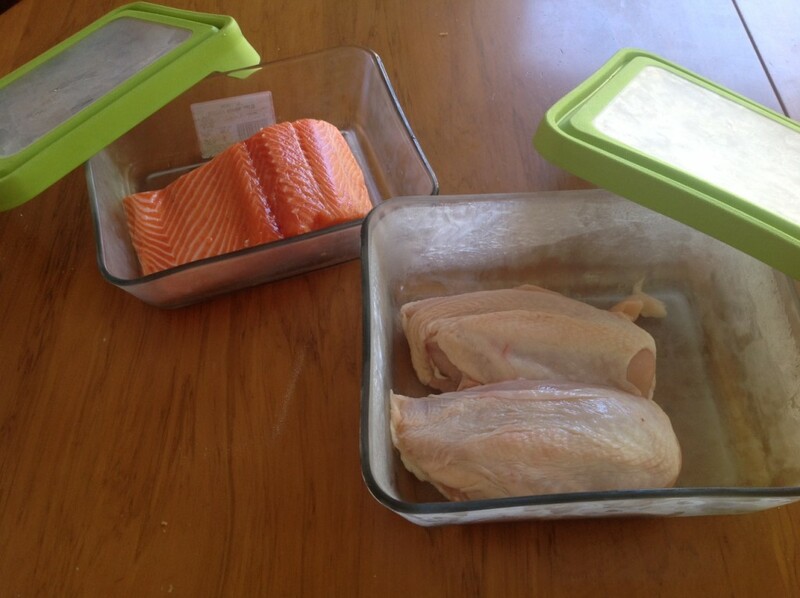 – So far I have only have two containers and as was evident today, this is not enough when buying meat for the week. 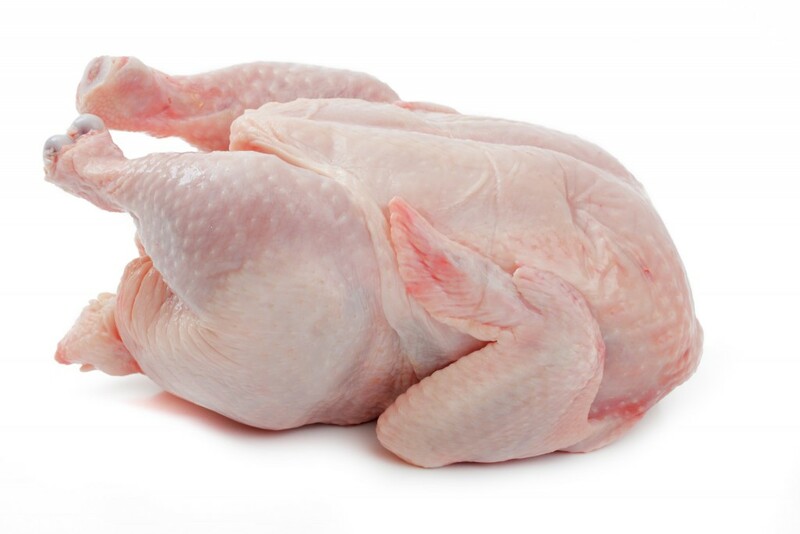 Meat products such as whole chickens or other roast cuts are still a challenge to buy without plastic. – Glass containers are not the solution for all meat purchases: I don’t think I can get a container big enough to accommodate a whole chicken or a leg of pork or lamb. I’d be happy for the meat to be wrapped in wax paper, then in plain paper as they used to once upon a time, but no-one does this these days. So more work to do here. So there you have it. That is where I’m up to with buying meat without plastic. But I don’t have time to go zero waste!